Starting with this one, I am giving my book reviews a little bit of a makeover.. Giving a bit of more details and making a little bit more "Nerdy".. but I kinda like it..
Jeffrey Archer has written a number of books including novels and short stories that topped the bestseller lists all around the world. This one however is my first read from the long list of books from him. It is a fiction novel set in mid 1960's and starts of in Moscow, Russia with a KGB officer being briefed about a mission. In the next chapter it turns to London and the "Hero" of the novel makes his entrance as Adam Scott, Adam and his family are gathered for the reading of his father's will. Adam is bequeathed with an envelope. According to his father it was up to Scott, whether to open the envelope or not, but if he chose to do open it he should never reveal the contents to anyone. With curiosity and caution he reads and unravels the mystery written on the piece of paper he has inherited but not without KGB officer Romanov, the "villain", CIA and his own countrymen after him. Thus the chase begins, with every page giving way to new mystery and answers. There is mystery,drama, action and even a detailed description of a torture by the Russians. You feel as if you are watching a James Bond movie. You can't help but turn page after page to know what happened next. Did Romanov come to know about it? Who was that man listening to Adam's conversation? Will Adam be able to escape? There are two other interesting characters in the book Lawrence and Robin. I love the way Robin's been described and the conversations between her and Adam as well as Romanov, it makes you laugh. thanks for dropping by! happy to follow you here and on bloglovin'! Sounds like a great read! I'm into all kinds of book so I might have to check this one out! Nice review dear :) will check it out.. my all time fav is kane and abel.. whats your? am following your blog now. Do check out my blog and leave a comment.. would mean a lot to me.. This is a really great review! 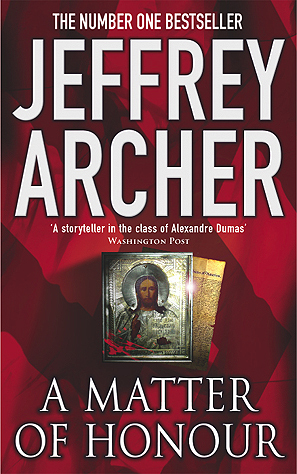 Will have to look into more Jeffrey Archer, I've heard amazing things. Thank you Mehak for leaving those sweet words for me in my blog ! I appreciate your feedback. I am a book lover as well and although I have not read this one, thanks for the review. You have written a very good and analytical review that will tempt any reader to read this book. 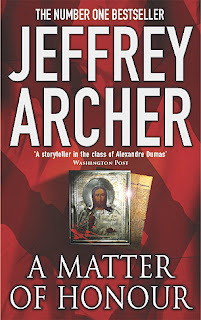 One of my closest friend is a Jeffrey Archer fan. She used to praise two of his other works 'A Quiver full of Arrows" and "Only time will tell". Looking forward to read more from you ! It is a very interesting plot, I will buy this book!